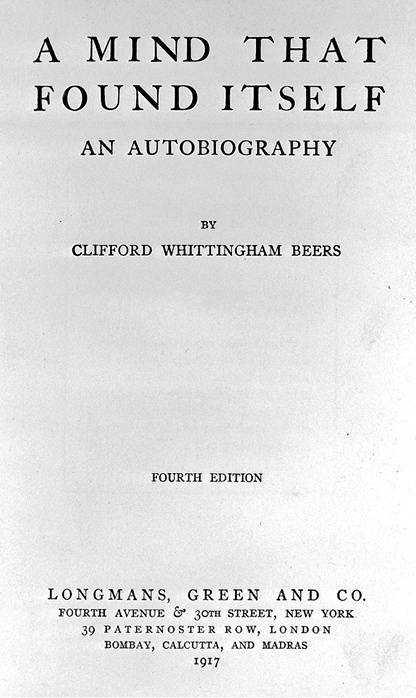 Clifford W. Beers is considered one of the founders of the mental health movement in the U.S.
Clifford W. Beers’ 1908 autobiography, A Mind that Found Itself, shattered stereotypes of mental illness. Beers found relief from chronic manic depressive illness at Rhode Island’s Butler Hospital. His determination to give meaning to his suffering let to the creation of both the National and the Rhode Island Mental Health Associations. For nearly a century, MHA of RI has advocated for effective and compassionate community care for mental illness. In the 1970s, MHA of RI led the movement for de-institutionalization. Today, MHA of RI fights for equity in mental healthcare coverage and effective statewide mental healthcare policies. We continue in our efforts to advocate for parity between mental and medical healthcare in health insurance packages and for the freedom of the individual to choose the best (not just the least expensive) medication. Together with other concerned individuals and organizations, MHA of RI fights for the rights of persons experiencing mental illness.